Perfect Gift Basket Resources – on a budget! A gift isn’t is extra special when it’s unique and from the heart…but it’s even better if it is also within your budget. And to accomplish that, all you have to do is make your loved ones a basket yourself! It’s heartfelt, it’s special, and if you do it right, it won’t cost you too much at all. 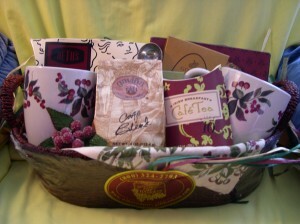 The special thing about the gift basket is that it is personalized to the person you are giving it to. All you have to do is listen, and you’ll make them the perfect present especially the baby’s first Christmas gift ideas in mind. Where do you get the supplies? Surprisingly, thrift stores like Goodwill have a huge selection of baskets for about a dollar a piece that you can use. And a lot of people don’t know this, but thrift stores actually carry a ton of unused, new, originally-packaged items that either stores with a surplus donate, or that people never ever used and donated them because that is simply the easiest thing to do. Just remember to keep in mind your theme when picking items out (I got REALLY carried away last time I went and forgot the logistics of also having my three kids with me to bring back to the car – the Goodwill attendant was very nice to help me carry the awesome brand new items I scored for really cheap). As for the filler and basket bag or shrink wrap, any dollar store should have that for you. Don’t get conned into paying too much at a craft or party supply store! You could even make your entire super special basket out of one simple trip to the dollar store! Got a candy junkie friend? Just get 15 different candy boxes, and you’re set! Got someone who needs to relax? Go to the bath and body section and pick out a bunch of relaxing scented soaps and body washes – they don’t need to be from the expensive boutique at the mall! Movie junkie? Just get them a double feature DVD with popcorn bowls and popcorn, and you’ve got yourself a fantastic movie night theme. The basket is special not because of the price, but because it was truly well-thought out and customized to your beloved receiver. What about a child who is a lover of crafts? Put crayons, construction paper, pipe cleaners, glitter, glue, scissors, and stickers in a basket, and you’ve probably even saved their mother’s life as well by keeping the craft lover busy and happy. If you have a whole group in mind, obviously Costco is your best bet. You could do an Italian-themed array of baskets by buying their bulk pasta, pasta sauce, parmesan, dried salami, pizzelles, biscotti, olives, seasoned artichokes, you name it. Most of the stuff at Costco is individually wrapped in bulk anyway. You can make a cheese lover very happy by scouting out the cheese section there, or even at any local grocery store. Or, put together a basket full of individually-wrapped healthy snacks for the whole office you can even add some supplements on there like cissus quadrangularis that I purchased from Amazon all the time. Don’t forget about the wine lovers! Partner their favorite bottle with some cheese and crackers, and they are going to have one good night! Organizing a benefit and need to put together baskets? Go to Costco, and you can get some of their high-quality name-brand stuff at a great price. You see, companies that sell gift baskets as a product either surcharge for the packaging, or they are able to do it at a reasonable price because they can buy bulk. Well, like I already said, you can do that at Costco, or even call in a favor from a friend who maybe works in a business where they are able to get even better bulk pricing for products by a supplier. Either way, the key is to make it personal, and not spend too much on your awesome personalized gift basket if you don’t have to!